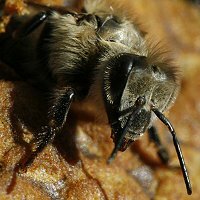 Native black honey bees (Apis mellifera mellifera), previously thought to be almost extinct in the UK, have been found in Lancashire. A study, funded by the Co-operative, has found that the species, which was believed to only exist in remote northern and western areas of the country, is doing well in the region. The project was part of the company’s Plan Bee campaign, which aims to boost urban beekeeping and distribute wildflower seeds to provide pollen and nectar for insects.